The story of Aalborg Monastery dates back to the 1400s. At that time Aalborg, on the natural crossing point over the Limfjord, had grown into a very busy trading town. 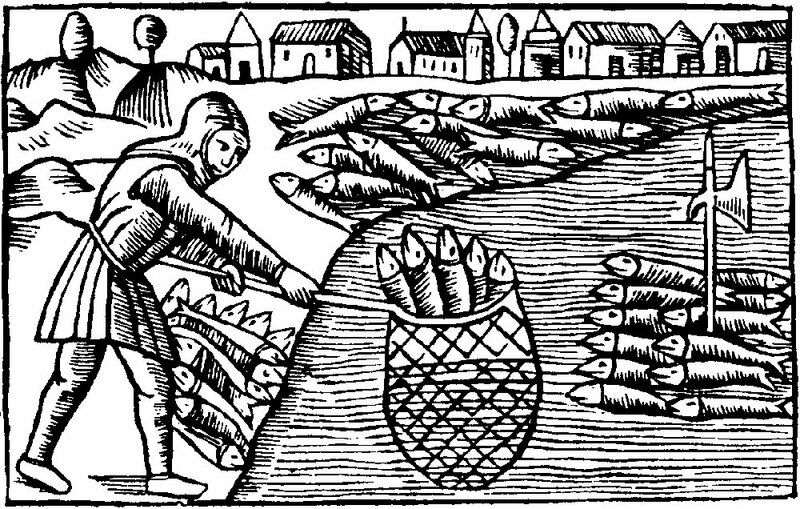 The fjord was alive with herring when, in 1430, Erik of Pomerania granted sole trading rights to the city. This was the basis of Aalborg’s prosperity during the Catholic era, trade with Lifland, Danzig and Lybæk flourished. Folk from the land flocked into the city for work and to share in the prosperity that undoubtedly seemed to be had by all in North Jutland. The frescoes in Aalborg Monastery are dated to the period 1508-1520. Aalborgian, Maren Hemmings, was a wealthy, warm-hearted and philanthropic woman. She noticed that not everyone was thriving in the city; poverty, malnutrition and appalling living conditions were rife. It had such an effect on her, that she donated a plot of land from her parent’s inheritance to the city, to establish a hospice where the poor, sick, needy, as well as the mentally & physically disabled, could find shelter and help. 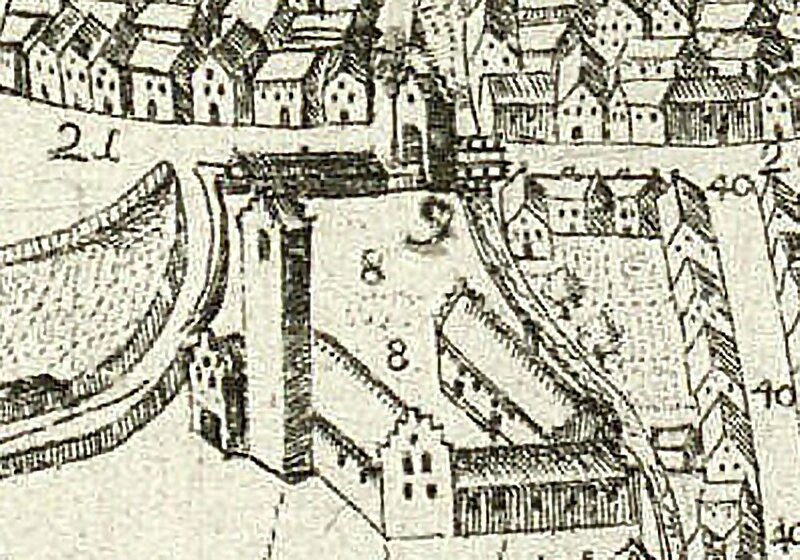 It is this plot of land that Aalborg Monastery now stands on to this day. At that time it was at the western most limit of the city; today the city has grown, so much so that the Monastery is now in the city centre. In 1434 fire destroyed the wooden buildings on the site. This allowed work to begin on the construction, in brick, of the present day Aalborg Monastery. The monastery buildings were completed in 1500 with the enclosing of the two gardens – the Nuns’ and Monks’ Gardens. To finish off the major building work, beautiful frescoes were painted on the vaulted ceiling of the Chapter Room. In 1451 Aalborg Monastery was admitted to the Order of the Holy Ghost; a hospital order founded by Guy de Montpellier in the south of France. The Order had drawn the attention of the Vatican, for during Pope Innocens III reign, the Order of the Holy Ghost was granted to his mother church in San Spirito, Sassia – very close to St Peter’s in Rome. The Monastery of the Holy Ghost in Aalborg was tasked with taking care of the poor, the sick, the crippled and the orphans. At the same time, the monastery gained considerable privileges. When the Monastery was closed, following the Reformation in 1536, its large property holdings throughout North Jutland: brickworks, mills, fishing waters and barns, were confiscated. 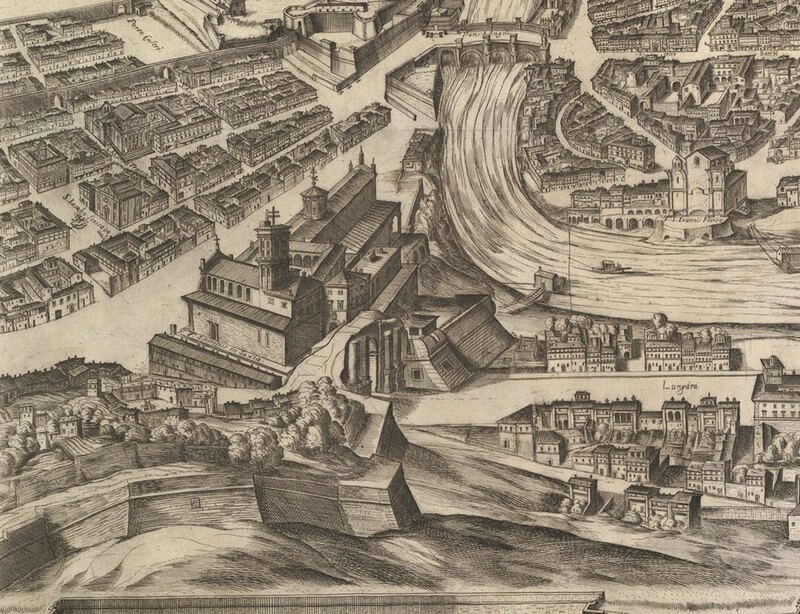 San Spirito Monastery in Sassia, Antonio Tempestas’ Map of Rome, 1645. Aalborg Diocesan Hospital and Latin School: Resens Atlas 1677. Note the tower of the original Monastery Church. After the Reformation, the Monastery was transformed into The Diocesan Hospital. In the former monks quarters, a Latin School, with access on Adelgade, was established and where it operated until 1848. It is still educating the young of the city to this day with the name Aalborg Cathedral School. 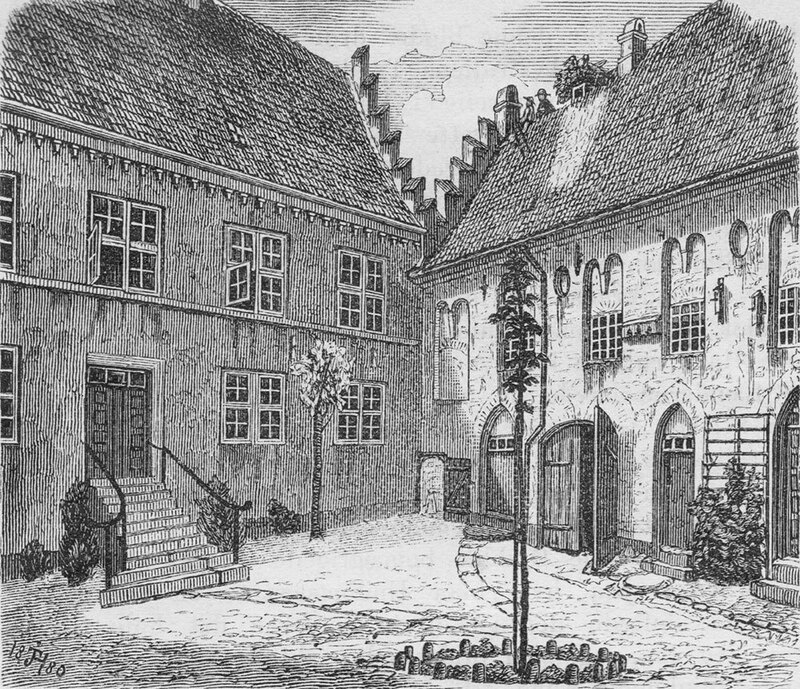 The Monastery Church, which enclosed the monks’ garden to the south (where the Latinergyden lies), was demolished after the Reformation. The stonework was transported down to the harbour where it was used for the building of Aalborg Castle. Later, a new chapel was built onto the westernmost wing – today it is an annex of Aalborg Cathedral. 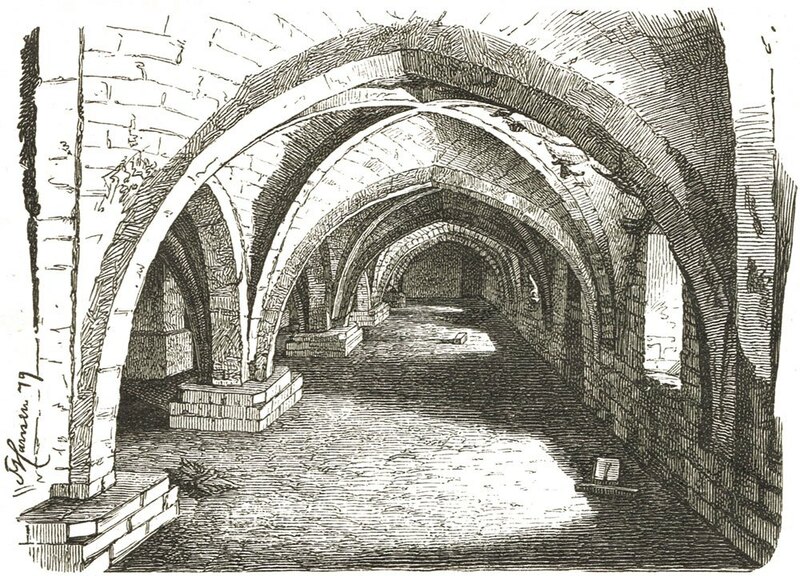 Below most of the west wing is a very interesting crypt with ceilings of cross-curved arches. At 40 meters long, it is Denmark’s largest, vaulted abbey basement from the Middle Ages. During the time of the monastery it was used as a storage room and a kitchen. It also contains a small prison cell. Later, in addition to the medieval monastery, two additional wings were built. In 1867 a ‘new hospital’ was built opposite the fountain and in 1906 a ‘hospice and care centre facing C.W. Obels Plads followed. Since the Middle Ages, the name of the institution had been Diocesan Hospital, identifying it as a ‘hospital’. The hospital management and its residents however, greatly wished to return to the old monastery name. Following a Royal Decree on 29 October 1954, the name of Aalborg Diocesan Hospital changed to Aalborg Monastery and, as from the 1 November that year, the new title, together with the subtitle The Monastery of the Holy Ghost in Aalborg, was formally adopted. As a consequence of this, the Hospital Church became the Monastery Chapel, the Hospital Garden, became Monastery Garden and the hospital warden became the Superintendant of the Monastery. Sample of the crypt under Aalborg Monastery&#39;s western wing. Wood cut from 1879. Section of the inner cloister courtyard with the west wing (left) and north wing 1880. Today the Monastery is a self-governing, private, charitable institution managed by a board of directors comprising: The Bishop, The Mayor, The Parish Priest of The Church of Our Lady, The Dean and The Chief of Police. By Royal Decree a Monastery Superintendant, who must reside in the monastery, has to be appointed. His or her duties are the day-to-day operation of the monastery and protection of its cultural heritage. A Monastery Caretaker is also to be employed to carry out daily maintenance tasks. This beautiful, old building and gardens complex must be carefully and properly maintained at all times. In keeping with its beginnings, it now offers a home, not to the poor, sick and needy, but to elderly persons. Today there are 27 apartments for the elderly, all of which offer modern facilities. They likewise must be maintained without detriment to the long history and many traditions of this old institution in the heart of Aalborg. 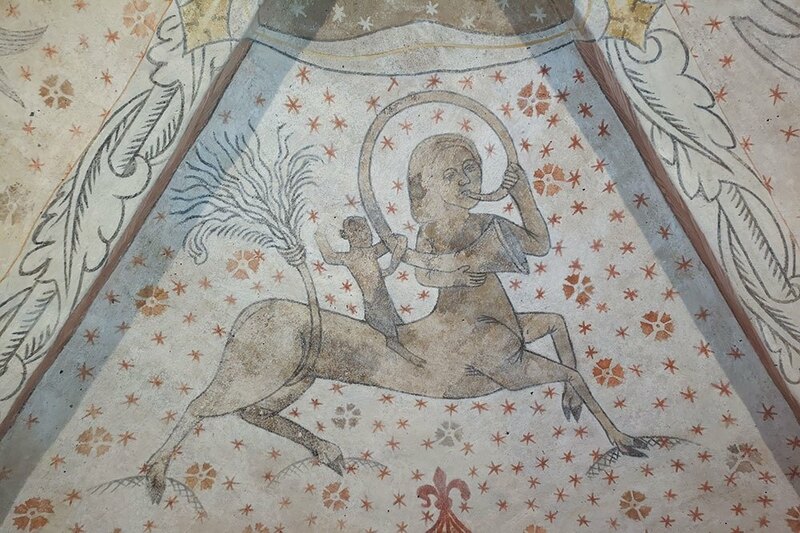 The Monastery of the Holy Ghost, Aalborg, draws a great deal of attention and recognition from Civil Societies, The Cultural Heritage Agency, The National Museum and other public bodies, but does not receive financial support from the public. English translation by Michael Pierce.